This article is about the Australian online service. For other uses of the word "trove", see trove (disambiguation). Trove's origins can be seen in the development of earlier services such as the Australian Bibliographic Network. It was originally known as the Single Business Discovery Service, a project that was launched in August 2008. The intention was to create a single point of entry for the public to the various online discovery services developed by the library between 1997 and 2008-2009 including Register of Australian Archives and Manuscripts, Picture Australia, Libraries Australia, Music Australia, Australia Dancing, PANDORA search service, ARROW Discovery Service and the Australian Newspapers Beta service. The key features of the service were designed to create a faceted search system specifically for Australian content. Tight integration with the provider databases has allowed "Find and Get" functions (e.g. viewing digitally, borrowing, buying, copying). Important extra features include the provision of a "check copyright" tool and persistent identifiers (which enables stable URLs). The scope of the project is to help "you find and use resources relating to Australia" and therefore the content is Australian-focused. Much of the material may be difficult to retrieve with other search tools as it is part of the deep web, including records held in collection databases, or in projects such as Picture Australia, Music Australia, the Register of Australian Archives and Manuscripts, Australia Dancing, Australian Research Online and the PANDORA web archive. Trove includes content from many libraries, museums, archives and other organisations. The site's content is split into "zones" designating different forms of content which can be searched all together, or separately. Books: allows searching of the collective catalogues of institutions findable in Libraries Australia using the Australian National Bibliographic Database (ANDB). People: allows searching of biographical information and other resources about associated people and organisations, from resources including the Australian Dictionary of Biography. Journals: searching of academic periodicals. Music, sound and videos: allows searching of digitised historic sheet music and audio recordings. Replacing the previous "Music Australia" website. Also includes searchable transcripts from many Radio National programs. Newspapers: allows text-searching of digitised historic newspapers. Replacing the previous "Australian Newspapers" website. Pictures: Including digitised photographs, drawings, posters, postcards etc. Considerable numbers of images on Flickr with the appropriate licensing are donated as well. Replacing the previous "Pictures Australia" website. Websites: the primary search portal of the PANDORA web-archiving service, which itself includes the "Australian Government Web Archive". Government Gazettes: allows searching of official publications written for the purpose of notifying the public of government business. A final "zone" called Lists allows logged-in users of Trove to make their own public compilations of items found in Trove searches. There is also a facility to join the Trove community and make contributions to the resources such as tags, comments and corrections. The book zone provides access to books, audio books, theses, conference proceedings and pamphlets listed in Australia's National Bibliographic Database (ANBD), which is a union catalogue of items held in Australian libraries and a national bibliographic database of resources including Australian online publications. Bibliographic records from the ANBD are also uploaded into the WorldCat global union catalogue. The results can be filtered by format if searching for braille, audio books, theses or conference proceedings and also by decade and language of publication. A filter for Australian content is also provided. 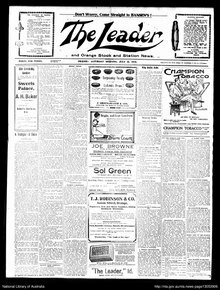 Front page of The Leader (Orange, New South Wales) 31 July 1915, the 10 millionth newspaper page to be made available through Trove. Trove provides text-searchable access to over 700 historic Australian newspapers from each State and Territory. By 2014, over 13.5 million digitised newspaper pages had been made available through Trove as part of the Australian Newspaper Plan (ANPlan), a "collaborative program to collect and preserve every newspaper published in Australia, guaranteeing public access" to these important historical records. 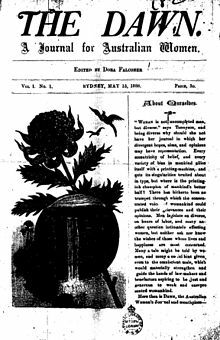 The extent of digitised newspaper archives is wide reaching and includes now defunct publications, such as the Australian Home Companion and Band of Hope Journal and The Barrier Miner in New South Wales and The Argus in Victoria. It includes the earliest published Australian newspaper, the Sydney Gazette (which dates to 1803), and some community language newspapers. Also included is The Australian Women's Weekly. The Canberra Times is the only major newspaper available beyond 1957. It allowed publication of its in-copyright archive up to 1995 as part of the "centenary of Canberra" in 2013, and the digitisation costs were raised with a crowdfunding campaign. Also crowdfunded, the Australian feminist magazine The Dawn was included on International Women's Day 2012. On 25 July 2008 the "Australian Newspapers Beta" service was released to the public as a standalone website and a year later became a fully integrated part of the newly launched Trove. The service contains millions of articles from 1803 onwards, with more content being added regularly. The website was the public face of the Australian Newspapers Digitisation Project, a coordination of major libraries in Australia to convert historic newspapers to text-searchable digital files. The Australian Newspapers website allowed users to search the database of digitised newspapers from 1803 to 1954 which are now in the public domain. The newspapers (frequently microfiche or other photographic facsimiles) were scanned and the text from the articles has been captured by optical character recognition (OCR) to facilitate easy searching, but it contains many OCR errors, often due to poor quality facsimiles. Since August 2008 the system has incorporated crowdsourced text-correction as a major feature, allowing the public to change the searchable text. Many users have contributed tens of thousands of corrected lines, and some have contributed millions. This collaborative participation allows users to give back to the service and over time will improve the database's searchability. The text-correcting community and other Trove users have been referred to as "Trovites". The National Library of Australia combined eight different online discovery tools that had been developed over a period of twelve years into a new single discovery interface that was released as a prototype in May 2009 for public comment before launching in November 2009 as Trove. It is continually updated to expand its reach. With the notable exception of the newspaper "zone", none of the material that appears in Trove search results is hosted by Trove itself. Instead, it indexes the content of its content partners' collection metadata and displays the aggregated information in a relevance-ranked search result. The service is built using a variety of open source software. Trove provides a free, public Application Programming Interface (API). This allows developers to search across the records for books, images, maps, video, archives, music, sound, journal articles, newspaper articles and lists and to retrieve the associated metadata using XML and JSON encoding. The full text of digitised newspaper articles is also available. Several citation styles are automatically produced by the software, giving a stable URL to the edition, page or article-level for any newspaper. Wikipedia was closely integrated from the beginning of the project, making Trove the first GLAM website in the world to integrate the Wikipedia API into its product. In a keynote address to the 14th National Australian Library and Information Association (ALIA) Conference in Melbourne, Roly Keating, Chief Executive of the British Library described Trove as "exemplary" – a "both-end choice" of deep rich interconnected archive. Digital humanities researcher and Trove manager Tim Sherratt noted that in relation to the Trove API "delivery of cultural heritage resources in a machine-readable form, whether through a custom API or as Linked Open Data, provides more than just improved access or possibilities for aggregation. It opens those resources to transformation. It empowers us to move beyond ‘discovery’ as a mode of interaction to analyse, extract, visualise and play." The site has been described as "a model for collaborative digitization projects and serves to inform cultural heritage institutions building both large and small digital collections". The reach of the newspaper archives makes the service attractive to genealogists and knitters. Trove received the 2011 Excellence in eGovernment Award and the 2011 Service Delivery Category Award. ^ Baich, Tina (May 2013). "The global research landscape: resources for locating international publications". College & Research Libraries News. 74 (5): 243–248. Archived from the original on 24 June 2014. Retrieved 16 December 2014. ^ a b c Holley, Rose (29 July 2010). "Trove: Innovation in Access to Information in Australia". Ariadne. Archived from the original on 13 November 2014. Retrieved 3 December 2014. ^ "An Innovation Study: Challenges and Opportunities for Australia's Galleries, Libraries, Archives and Museums". Australian museums must innovate or risk becoming 'digital dinosaurs'. CSIRO. 16 September 2014. Archived from the original on 24 October 2014. Retrieved 18 December 2014. ^ Sweeney, Shahida (26 September 2014). "National Library of Australia invests in digital future". CIO Magazine. Archived from the original on 11 December 2014. Retrieved 3 December 2014. ^ a b c Thorpe, Clarissa (8 November 2014). "National Library of Australia's Trove website celebrates five years of uncovering the past". ABC News. Archived from the original on 23 November 2015. Retrieved 5 September 2015. ^ a b Cathro, Warwick. "Single Business Discovery Project". National Library of Australia. Archived from the original on 9 December 2014. Retrieved 5 December 2014. ^ a b Ayres, Marie-Louise (2013). "Singing for their supper: Trove, Australian newspapers, and the crowd" (PDF). IFLA World Library and Information Congress. Archived (PDF) from the original on 23 November 2015. Retrieved 3 December 2014. ^ "About Us". Trove. National Library of Australia. Archived from the original on 7 February 2015. Retrieved 15 December 2014. ^ "Current work counts by zone". Trove. National Library of Australia. Archived from the original on 7 October 2014. Retrieved 3 December 2014. ^ "Using Trove – Finding things". Trove. National Library of Australia. Archived from the original on 24 December 2014. Retrieved 16 December 2014. ^ Sherratt, Tim (17 April 2014). "Harvesting Radio National". Trove Blog. National Library of Australia. Archived from the original on 10 December 2014. Retrieved 6 December 2014. ^ "Picture query page". Archived from the original on 3 December 2014. Retrieved 6 December 2014. ^ Rajapatirana, Bemal; Missingham, Roxanne (February 2005). "The Australian National Bibliographic Database and the Functional Requirements for the Bibliographic Database (FRBR)". The Australian Library Journal. 54 (1): 31–42. doi:10.1080/00049670.2005.10721711. ^ "OCLC Agreement". Libraries Australia. National Library of Australia. Archived from the original on 10 December 2014. Retrieved 6 December 2014. ^ Rathi, Dinesh; Shiri, Ali; Lucky, Shannon (2013). "Evolving and Emerging Trends in Digital Libraries User Interfaces". In Proceedings of the Annual Conference of CAIS/Actes du congrès annuel de l'ACSI. Archived from the original on 17 December 2014. Retrieved 16 December 2014. ^ a b Weight, Mary-Louise (2010). "Trove – One Search, a Wealth of Information". Incite. 31 (1/2): 10–11. ^ "Refining your results". Trove help. National Library of Australia. Archived from the original on 17 December 2014. Retrieved 16 December 2014. ^ Wyatt, Liam (21 June 2013). "10 Million newspaper pages in Trove". Trove Blog. National Library of Australia. Archived from the original on 9 December 2014. Retrieved 5 December 2014. ^ "About Digitised Newspapers and more". Trove. National Library of Australia. Archived from the original on 29 February 2016. Retrieved 22 May 2017. ^ a b "Australian Newspaper Digitisation Program". National Library of Australia. Archived from the original on 2 July 2015. Retrieved 3 December 2014. ^ Australian Newspaper Plan Archived 7 December 2014 at the Wayback Machine. ^ "Newspaper Titles". Trove. National Library of Australia. Archived from the original on 29 February 2016. Retrieved 3 December 2014. ^ Rohan, Pearce (22 November 2010). "National Library puts iconic Aussie magazine on Web". PCWorld. Archived from the original on 9 December 2014. Retrieved 7 December 2014. ^ Boland-Rudder, Hamish (26 December 2013). "Yesterday's Canberra news gets an update for digital age at National Library". The Canberra Times. Archived from the original on 20 February 2014. Retrieved 5 December 2014. ^ Warden, Ian (18 June 2013). "Four more decades of print now in digital". The Canberra Times. Archived from the original on 12 January 2015. Retrieved 7 December 2014. ^ "The Dawn rises again". National Library of Australia. 8 March 2012. Archived from the original on 19 May 2014. Retrieved 19 May 2014. ^ Ross, Monique (8 March 2012). "New dawn for historic suffragette journal". ABC News. Archived from the original on 5 January 2015. Retrieved 7 December 2014. ^ "NLA.gov.au". NLA.gov.au. 17 February 2012. Archived from the original on 25 August 2012. Retrieved 30 May 2012. ^ Foreshew, Jennifer (20 September 2011). "Devil in the detail for landmark National Library of Australia project". The Australian. Retrieved 16 December 2014. ^ Riley, Carole (6 August 2008). "Australian Newspapers Digitisation Project". Heritage Genealogy. Archived from the original on 17 December 2014. Retrieved 16 December 2014. ^ Drake, Jess (15 May 2014). "Trove's Volunteers". Trove Blog. National Library of Australia. Archived from the original on 10 December 2014. Retrieved 7 December 2014. ^ Walters, Conrad (7 February 2011). "Volunteers with an eagle-eye on the news". Sydney Morning Herald. Archived from the original on 25 September 2015. Retrieved 7 December 2014. ^ Tester, Alona. "Trove Celebrates with TROVEmber". Genealogy and History News. Archived from the original on 10 December 2014. Retrieved 5 December 2014. ^ Ayres, Marie-Louise (4 September 2012). "Digging deep in Trove: Success, challenge and uncertainty". National Library of Australia. Archived from the original on 5 December 2014. Retrieved 3 December 2014. ^ Clarke, Trevor (28 April 2010). "Australian National Library uses open source for treasure Trove". ComputerWorld. Archived from the original on 9 December 2014. Retrieved 7 December 2014. ^ "Trove: mapping Australia's culture where Google fears to tread". APC. 29 April 2010. Archived from the original on 9 December 2014. Retrieved 7 December 2014. ^ "Trove API lets developers delve deeper". National State Libraries Australasia. 19 April 2012. Archived from the original on 17 December 2014. Retrieved 16 December 2014. ^ perkinsy (11 March 2014). "An Introduction to the Trove API". Archived from the original on 8 December 2014. Retrieved 16 December 2014. ^ "Building with Trove". Trove Help. National Library of Australia. Archived from the original on 17 December 2014. Retrieved 16 December 2014. ^ "Building with Trove". National Library of Australia. Archived from the original on 17 December 2014. Retrieved 3 December 2014. ^ Holley, Rose (6 August 2009). "Perspectives on National Library of Australia Developments Part 1 Rose Holley – Presentation slides from GLAM-Wiki conference, Canberra". Slideshare. Archived from the original on 19 December 2014. Retrieved 2 December 2014. ^ "Keynote speakers at 2014 National ALIA conference". Archived from the original on 27 February 2015. Retrieved 2 December 2014. ^ Sherratt, Tim. "'A map and some pins': open data and unlimited horizons". Invisible Australians: living under the White Australia Policy. Archived from the original on 23 February 2014. Retrieved 3 December 2014. ^ Kidman, Angus (5 July 2010). "Trove Lets You Locate Books In Any Australian Library". Archived from the original on 5 December 2014. Retrieved 3 December 2014. ^ "Trove: Discover Genealogy Treasure in the National Library of Australia". Gould Genealogy and History. Archived from the original on 5 December 2014. Retrieved 3 December 2014. ^ Gedda, Rodney (2 June 2011). "CeBIT 2011: Trove search engine wins eGovernment award: Content from more than 1000 libraries". TechWorld. Archived from the original on 4 December 2017. Retrieved 5 December 2017. Boston, Tony. "Exposing the deep web to increase access to library collections". National Library of Australia. Retrieved 16 December 2014. In Treloar, Andrew; Ellis, Allan; Southern Cross University (2005). AusWeb05 : the eleventh Australasian World Wide Web Conference : AusWeb05 : making a difference with the web : proceedings of AusWeb05. Southern Cross University. ISBN 978-0-9751644-3-3. Archived from the original on 15 February 2017.